Being a librarian, I’ve always had an interest in the Disney Archives (yes, Dave Smith is a personal hero) and any other library related to the Disney Company. I’m always on the lookout for information about the Imagineering libraries, the art libraries and the other corporate institutions. 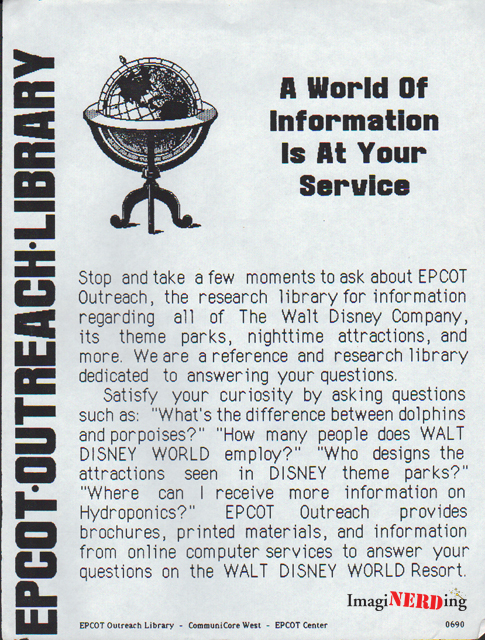 Sadly, I never got to experience the EPCOT Outreach Library, which existed from 1983-1994 in Communicore West. 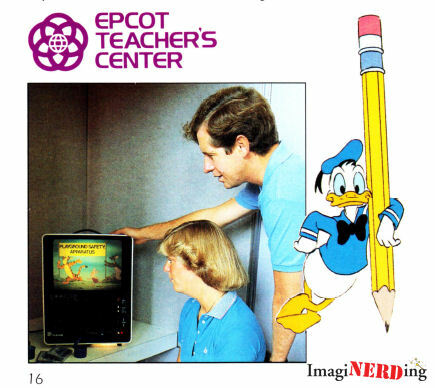 It included the EPCOT Teacher’s Center (Educational Tools for Today’s Teachers), which is also fairly elusive. 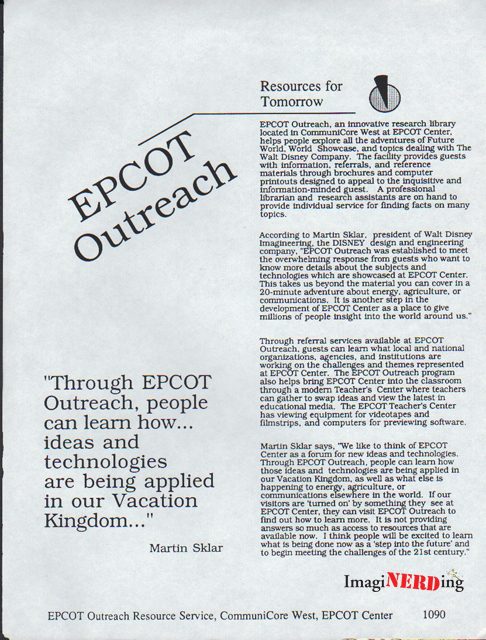 In a recent acquisition of Disney ephemera, I ran across two pages of material discussing the Epcot Outreach Library. The image above is from the 1994 Walt Disney World Souvenir Guidebook. This is the first photo of it that I’ve seen in an official publication. It is mentioned in some of the earlier guidebooks, but just a sentence or two. 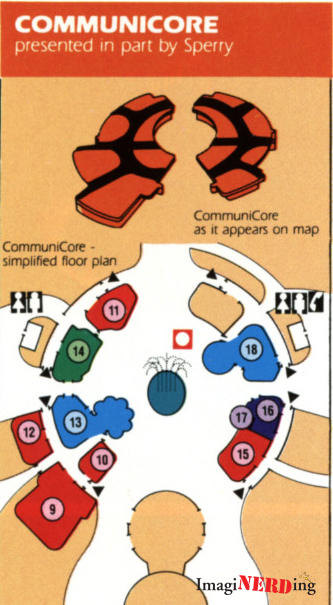 From a 1984 Guide Map to EPCOT Center. Epcot Outreach is number 16 and the Teacher’s Center is number 17. The following two images are photocopies that were handed out at the library. I’ve transcribed the text. Stop and take a few moments to ask about EPCOT Outreach, the research library for information regarding ail of The Walt Disney Company, its theme parks, nighttime attractions, and more. We are a reference and research library dedicated to answering your questions. Satisfy your curiosity by asking questions such as; “What’s the difference between dolphins and porpoises?” “How many people does WALT DISNEY WORLD employ?” “Who designs the attractions seen in DISNEY theme parks?” “Where can I receive more information on Hydroponics?” EPCOT Outreach provides brochures, printed materials, and information from online computer services to answer your questions on the WALT DISNEY WORLD Resort. EPCOT Outreach, an innovative research library located In CommuniCore West at EPCOT Center, helps people explore all the adventures of Future World, World Showcase, and topics dealing with The Walt Disney Company, The facility provides guests with information, referrals, and reference materials through brochures and computer printouts designed to appeal to inquisitive and information-minded guest. A professional librarian and research assistants are on hand to provide individual service for finding facts on many topics. Through referral services available at EPCOT Outreach, guests can learn what local and national organizations, agencies, and institutions are working on the challenges and themes represented at EPCOT Center. The EPCOT Outreach program also helps bring EPCOT Center into the classroom through a modern Teacher’s Center where teachers can gather to swap ideas and view the latest in educational media. The Teacher’s Center has viewing equipment for videotapes and filmstrips, and computers for previewing software. The following two images are from a 1984 educational catalog released by Disney. Ryan, over at the Main Street Gazette posted a press image from the Teacher’s Lounge. Check it out! So, there you have it. 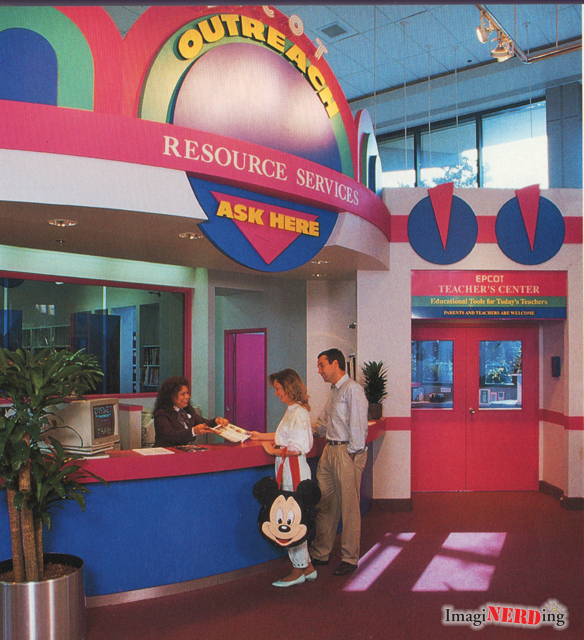 Pretty much everything that I know about the EPCOT Outreach Library. 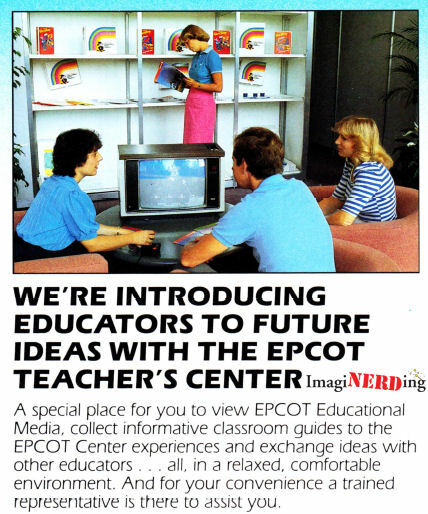 Do you have any images or fond memories of the EPCOT Center Outreach Library or the Epcot Teacher’s Center?